What is this Trident anyway? Trident is Britain’s nuclear weapons system. It is made up of four nuclear submarines. Each sub carries up to eight missiles on board, and each missile carries up to five nuclear bombs – or warheads – on top. Each of these bombs is around eight times as destructive as the bomb which flattened Hiroshima in 1945, killing over 140,000 civilians. One Trident submarine patrols the seas at all times. Why does the government want to replace it? Because the current submarines will start to come out of service from 2032. A very similar submarine-based system. In a Parliamentary vote that was called at very short notice in 2016, a majority of MPs voted in favour of going ahead with building four submarines for a new nuclear weapons system. Parliament had an ill-informed, head-in-the-sand debate about the issue, where the Prime Minister even refused to confirm what a new system will cost. Does CND have any ideas about the cost? We’ve calculated that replacing Trident will end up costing an astonishing £205 billion. Building new submarines will cost over £40bn. Then the running costs over the new system’s lifetime and eventual decommissioning have to be taken into account. The warheads will eventually need to be replaced. Additional costs include extending the life of the missiles and paying for military and police protection to guarantee the system’s security. This money would be better spent on employing more nurses and teachers, developing clean energy, scrapping tuition fees or building affordable homes. Who will this new Trident defend us against then? No-one seems to have an answer to this. The government’s own security assessment correctly identifies the actual threats we face today as terrorism, cyber-attacks, pandemics and climate change. Threats which nuclear weapons are useless in addressing. Surely it is an insurance policy for an uncertain future? This is just what the government says. But it is a very odd insurance policy, which actually increases the risks that it is supposed to protect us against. If Britain shows the world that we think our security depends on us having nuclear weapons far into the future, then other countries without them will want them too. So the dangers of accidents or crises increase. India and Pakistan are less secure with nuclear weapons today than they were when they did not have them. Why not just cut down the destructive power we now have to a lower level? Reductions are good as a first step forward, but they do not solve the problem when one bomb alone can kill hundreds of thousands of people. Even a ‘small’ nuclear exchange would kill millions. It would have a devastating impact on the world’s climate, resulting in a major drop in temperature leaving large parts of the world’s agricultural land unable to produce crops so millions more would starve. No matter how few or how many nuclear weapons countries have, while they exist at all other countries will try to get them too. The only way to be really safe is to abolish all nuclear weapons. This is what the majority of the countries in the world and their people want. Have any countries actually got rid of their nuclear weapons? Yes: South Africa dismantled its nuclear arsenal entirely between 1989 and 1993. Ukraine, Kazakhstan and Belarus gave up their nuclear weapons following the break-up of the Soviet Union. How many countries now have nuclear weapons? At least eight, and possibly nine. They have around 15,000 nuclear warheads between them. Have there ever been accidents or moments of tension when nuclear weapons might have been used? There have been plenty of dangerous accidents and several moments of crisis when leaders or military advisors wanted to use them. We have, says Robert McNamara, who was once in charge of US nuclear policy, been very lucky. It is not a luck which can hold out forever. What does the rest of the world think about us having nuclear weapons? They’re not very happy, especially as Britain signed a legally binding treaty in 1968 agreeing to to disarm. Is that the nuclear Non-Proliferation Treaty? That every signatory is entitled to have civilian nuclear energy. That those without the bomb at the time would not try to get it. That those five countries then with the bomb would negotiate the elimination of all nuclear weapons. Are the countries with nuclear weapons in violation of the NPT? Yes, since no negotiations aimed at the abolition of nuclear weapons have ever even started. All we have had are negotiations aimed at good housekeeping of nuclear arsenals – not so many nuclear weapons, rules about test explosions, and agreements not to put them into space, for instance. Has the International Court of Justice had anything to say about all this? Certainly. In 1996 the Judges of the Court said unanimously that ‘there is an obligation to pursue in good faith and bring to a conclusion negotiations leading to nuclear disarmament in all its aspects under strict and effective international control’. How does that ruling affect Trident replacement? For Britain to decide to replace Trident, and at the same time refuse to start abolition negotiations, it cannot possibly demonstrate the ‘good faith’ demanded by the International Court Judges. 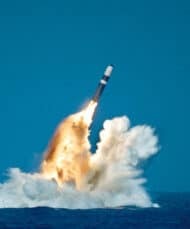 Trident replacement will mean Britain possessing nuclear weapons until around 2060 – 90 years after we agreed to disarm! Will other countries take action? The UK government refused to participate in the negotiations and even issued a statement attacking the treaty. There are still too many top people in countries with nuclear weapons who still think of nuclear weapons as status symbols or even as useable weapons of war. What does CND think the British government should do? Our government should sign the treaty. In this spirit, Trident should be scrapped and plans for its replacement cancelled in what would be a significant step towards a nuclear weapons-free world. 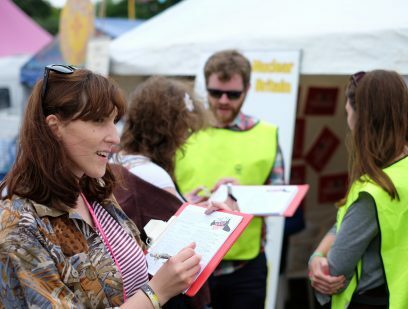 Successive governments – ever since signing the NPT – have repeated their commitment to a world without nuclear weapons through multilateral disarmament and now is the time for them to act.